In-Town, 2 Bdroom! Tidal Marsh Views, 10 Minute Walk to Beach! This 2 bedroom, 1 bath year-round third floor flat is located in the scenic New England town of Madison, Connecticut on Long Island Sound. This 1000 square foot third floor guest home is part of a stately old summer house built in 1918. Master bedroom has own cable television and king bed with plenty of closet and bureau space. 2nd bedroom includes bunk bed with double lower and trundle bed if needed. Large living room with cable TV, full dining area, and full kitchen. Bathroom with shower. Sun on hardwood floors throughout. Deck next to tidal marsh great for bird watching or relaxing with a book. During summer months, ask about use of above ground pool as part of your experience. This flat is centrally located, yet tucked away in a wooded enclave. It is within a 10 minute walk of local town beaches as well as the in-town independent theatre. A fine French Bistro can be found a block away, right behind the local Audubon Shop. Hammonasett State Park is only a mile up the road. Madison is one of a series of small seashore towns where boating, beaches, swimming, and gorgeous water views keep visitors coming back year after year. Day trips to Providence and Newport Rhode Island, Old Essex CT, Yale/New Haven and Mystic Seaport and Aquarium, as well as Lake Compounce (the oldest continuously operating amusement park in North America) are among the local venues for daytrips. Madison is fortunate to have an independent theatre and one of America's finest independent book stores, RJ Julia. And of course there is a diverse selection of restaurants in Madison and surrounding towns. If you are bringing children, the town of Madison hosts a variety of summer camps (sailing, soccer, swimming etc.). Horseback riding camps for children and lessons for adults minutes away at fabulous Guilford Riding School. After a fun-filled day, visit Stone Temple Sanctuary for a relaxing massage. They are located just down the street from this conveniently located rental! Grew up spending the summers in Madison with my grandmother. Now that I own a family residence with a third floor guest home attached here in Madison, I would like others to have the opportunity to build New England seashore memories. Whether in the autumn, winter, spring, or summer, Madison is beautiful any season. Open floor plan, connected to dining room area. Large TV/dvr combo. Deck overlooks marsh area. Umbrella, chairs and table. Super cute spacious apartment located down the street from Hammonaset state park and walking distance to Madison center shops. Fully equipped and stocked with all the essentials. Comfy beds, games, internet and cable. Nice property over looking the marsh with walking trails down the street. My guy, myself and our dogs enjoyed our stay very much. This was a great central location to stay in for visiting places along the Southern Coast of Conn. Criss, the owner, and her son were extremely helpful several times. The apartment was extremely clean and very comfortable to stay and cook in for the whole week. We had a wonderful stay at Criss’ apartment. The space was clean and comfortable and on the top floor at treetop level made us feel one with nature. We so appreciated how well equipped the place was with games, books, Nintendo wii, coffee and kitchen supplies. 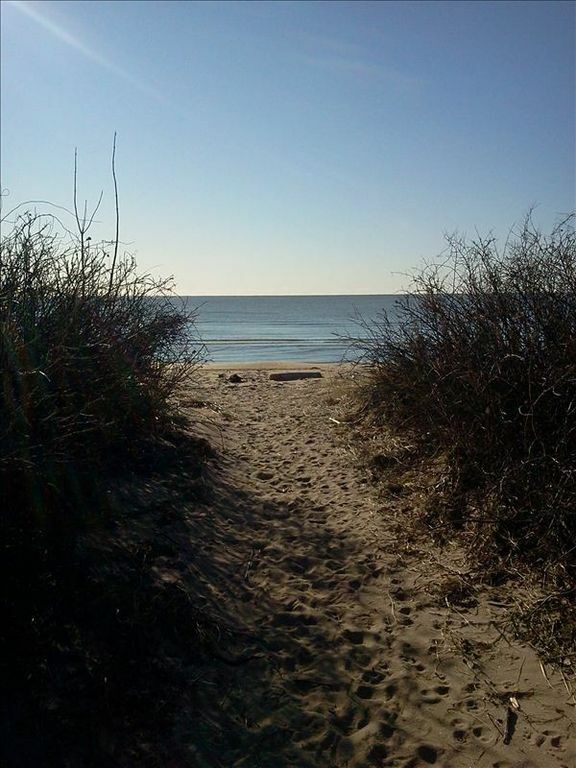 The location had such easy access to town, the beach, and Route 95. We would love to stay again for our next visit to CT! Loved our stay. Convenient to everything. Comfortable stay. Hope to return. Loved the apartment!! It had everything u would need. I can pack light since there is a washer and dryer there. Had beach chairs, towels and sand toys for my 3 year old. Will definitely go back. Criss was most accommodating! She made sure we had everything we needed as well!! Because it was on the top floor, the apartment was very light with lots of windows and beautiful views of the trees and woodlands. Very comfortable for 4 people, nicely decorated and well-stocked. It was very clean and quiet. We really enjoyed our stay! This is a perfect rental for weekend retreats, get togethers, get aways, and weeklong/month vacations! 10 minute walk to Madison's independent theater, fine dining, Long Island Sound beaches, Madison village shopping, and the library. This flat is on the main street through the town of Madison, yet it is on a two acre wooded property that tucks it away into privacy. Bird watch from your deck that overlooks the tidal marsh. Lawn games are also at your disposal. Relax with a book on your deck overlooking the tidal marsh, or stroll the beach or the sidewalks in town. There is something for everyone in your group to enjoy. Please ask about fee for pets.